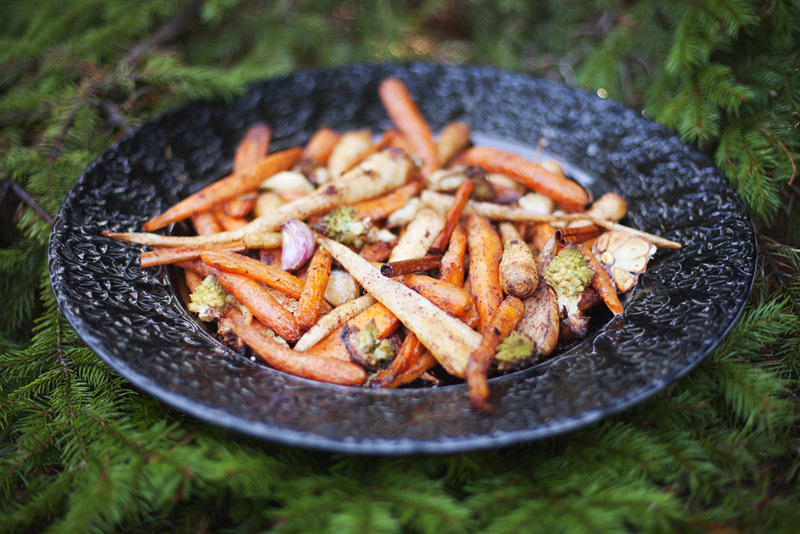 A while back we received an email from one of the editors at Bon Appétit Magazine, asking if we wanted to create a vegan and gluten-free Christmas menu for them, as a special web feature. We usually aren’t strictly vegan or gluten-free, but were so flattered by the offer that we didn’t have to think more than 2 seconds before answering them that we would happily take it on as a challenge (while dancing a silly dance and singing “We are working with BA, we are working with BA…”). 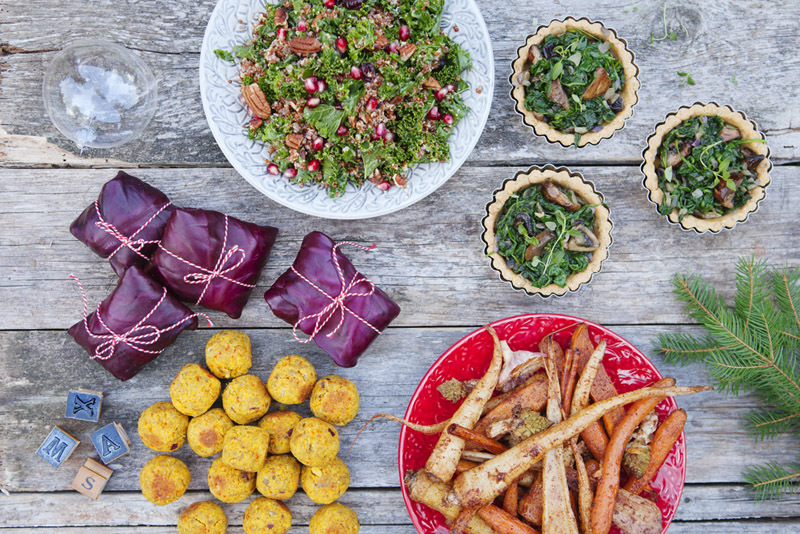 We came up with five different recipes; Cinnamon roasted root vegetables, Mustard kale salad, Spiced spinach tarts, Christmas falafels and a Pomegranate cheesecake. It is always fun to cook at Christmas since you get to use holiday flavors like saffron, clove, cinnamon, mustard and lemon. We hope that the recipes will be of some assistance in all the Christmas commotion, wether you make one dish or go for the whole menu. The whole thing has been up on the Bon Appétit web for about a week now, and apparently it is on their top list of most popular articles (we’re dancing that silly dance again!). Click here to see it on Bon Appétit. You can also scroll down to read the recipes here. 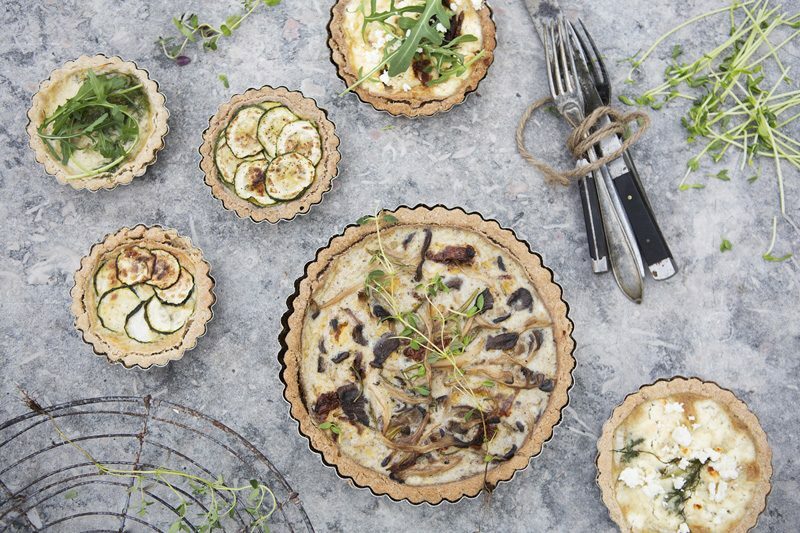 Our gluten-free tart crust has the subtle taste of almonds and fresh herbs, and it can be filled with just about anything. 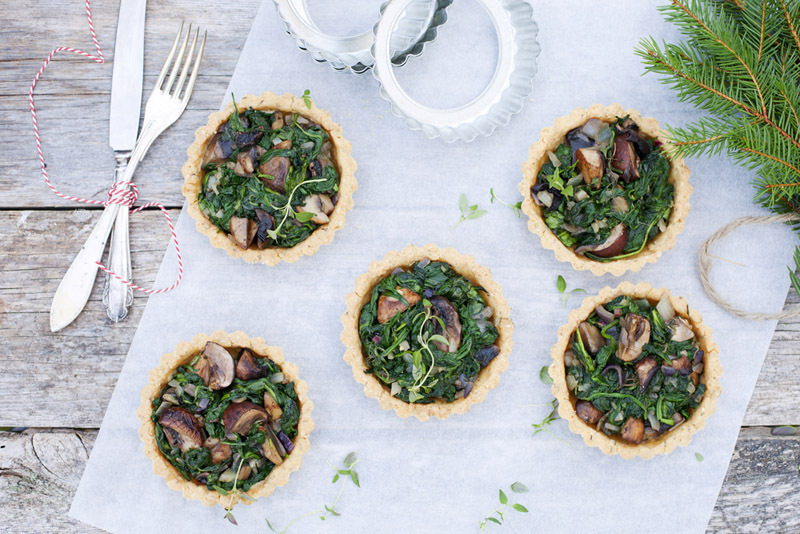 One of our favorites is this clove-spiced spinach and mushroom filling. Potato starch, tapioca starch, and all flours are available from Bob’s Red Mill. Making the Tartlet shells: Combine the first 4 ingredients in a bowl; season with salt and pepper. Add coconut oil and 3 Tbsp. ice-cold water. Using your hands, work dry ingredients toward the center until dough forms. Gather dough into a ball, wrap in plastic, and chill for 30 minutes. DO AHEAD: Dough may be made 1 day ahead. Wrap tightly with plastic and chill. Preheat oven to 375°. Divide dough evenly into 6 portions. Form each portion into a ball and press 1 dough ball evenly onto bottom and up sides of each tartlet pan. Trim dough flush with edge of pans. Prick bottom with a fork to prevent it from bubbling as it bakes. Bake until golden, about 15 minutes. Let tartlet shells cool slightly, then invert each pan and turn out shells onto a wire rack and let cool completely. Making the filling Heat oil in a large skillet over medium heat. Add onion and cloves and cook until onion is lightly browned; add spinach, leek and mushrooms. Cook until spinach is brightly colored, 3–5 minutes. Add lemon juice and cook 2 minutes longer. Spoon 2 dollops filling into each tartlet shell and serve hot. For this vegan and gluten-free dish, we were inspired by two Swedish Christmas classics—saffron buns and Swedish meatballs. 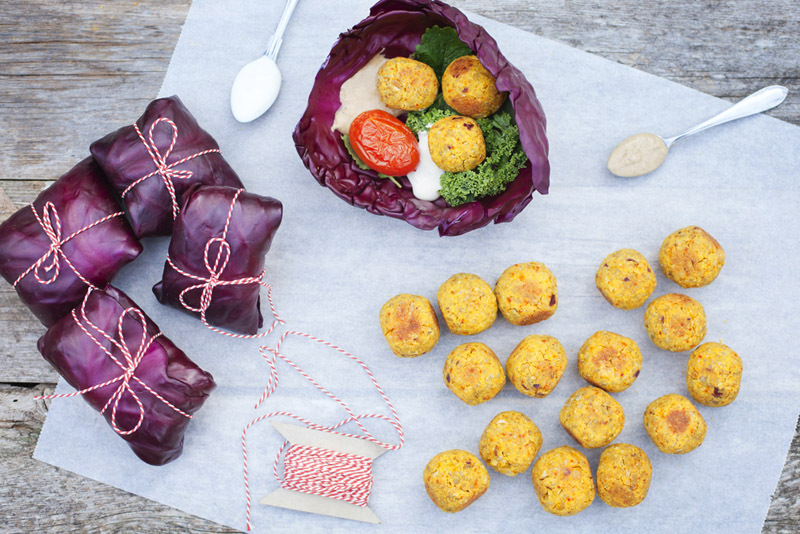 Use red cabbage leaves to wrap individual falafel into small parcels; they’ll look like mini Christmas presents that you’ve set out for your guests. 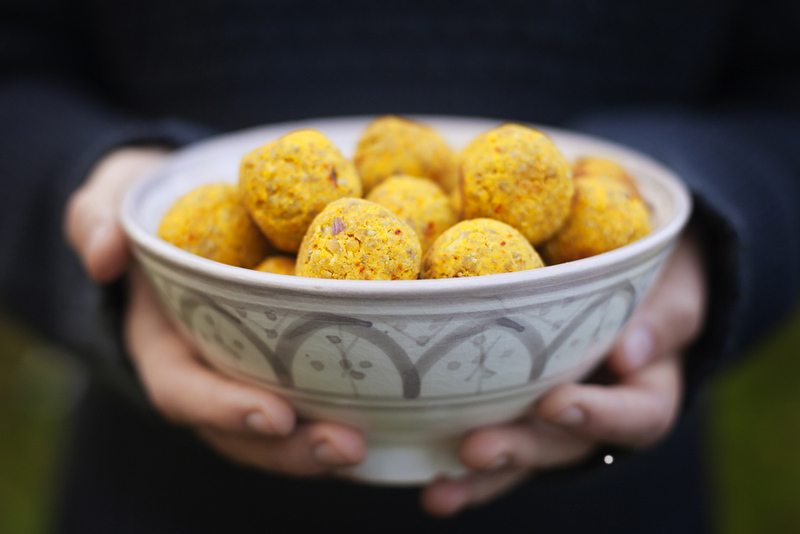 You might recognise this recipe since it is similar to our herb and pistachio falafels. Making the falafel: Preheat oven to 375°. Line a baking sheet with parchment paper. Pulse sunflower seeds in a food processor for about 30 seconds. Add chickpeas and pulse 1 minute longer. Add onion and remaining ingredients and pulse, occasionally scraping down sides of work bowl, until mixture is slightly coarse and well combined. Using your hands, form 24 small round falafels and place on prepared sheet. Bake, turning every 5 minutes, until falafels are evenly brown, about 15 minutes. Making Tahini dressing: Using a fork, beat tahini, orange juice, and garlic in a bowl until creamy dressing forms. Set aside. Assembling: Gently separate leaves from cabbage; rinse and pat dry. Place 2 falafels in the center of a cabbage leaf. Top with a few greens; spoon a little dressing and yogurt over. Fold each side of leaf in toward center, about 1”–2”, then fold the end closer to you over the filling and tuck it under the falafels. Tie with kitchen twine to hold together. This simple dish takes just a few minutes to prepare; then the oven does the rest of the work. You can throw any kind of vegetable in here; simply adjust the cooking time according to the size. Here is one of our absolute Christmas favorites. Red quinoa, with a mustard and lemon dressing, served with fresh kale, pomegranate seeds, cranberries, and roasted pecans is perfect for any holiday gathering. You don’t want to miss this one. Rinse quinoa in water. Drain and place in a medium size heavy pot; add 2 cups water and season with salt. Bring to a boil, reduce heat, and simmer until a curly string-like germ has separated from the circular part, 15–20 minutes. Let cool slightly. Meanwhile, whisk oil, lemon zest and juice, and mustard in a bowl until smooth and creamy; season mustard dressing with salt. 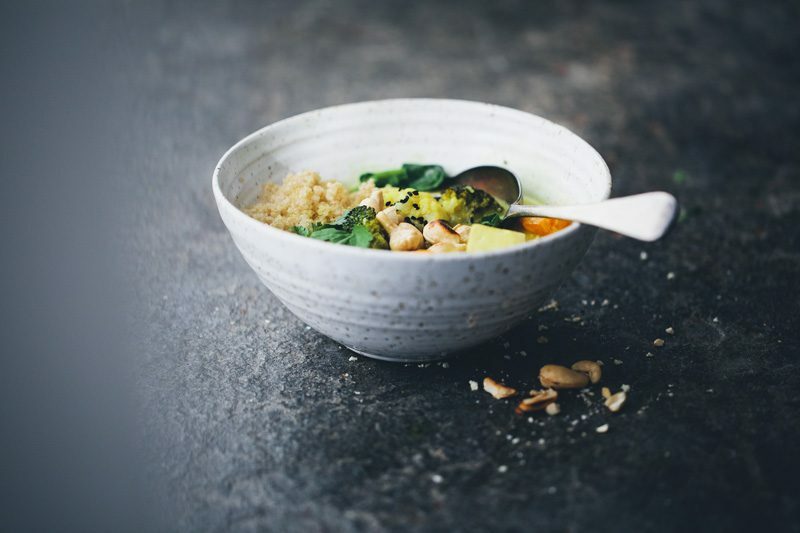 Transfer quinoa to a bowl and drizzle with mustard dressing; toss to coat. 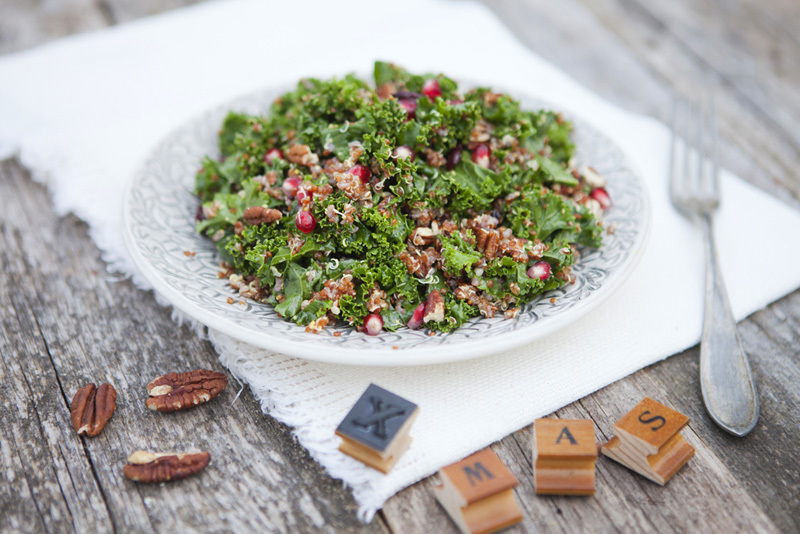 Divide kale among serving plates; top with quinoa, cranberries, and pecans, dividing equally. 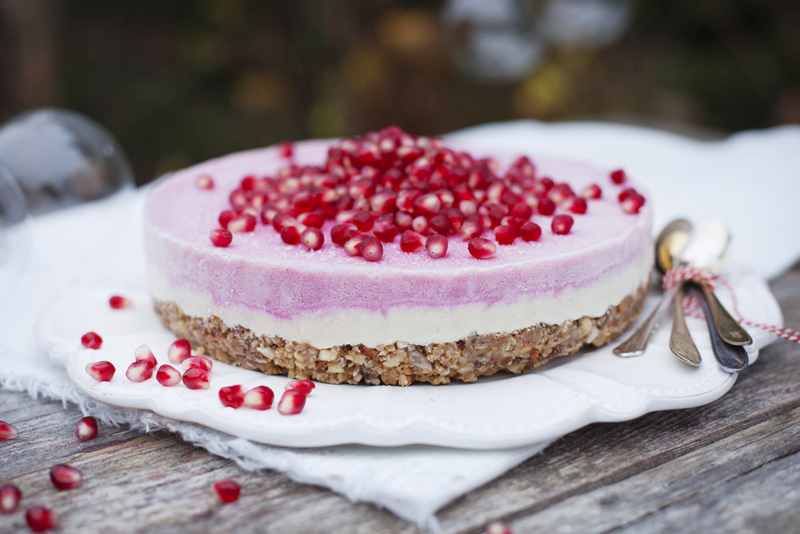 Garnish with pomegranate seeds. This is a Christmas version of our Flower Power cake. We use soaked cashews that when blended become super creamy and smooth. The crust is sweet and crunchy with nuts and dates, and the pomegranate topping adds a fresh, fruity note to the Christmas spiced filling. 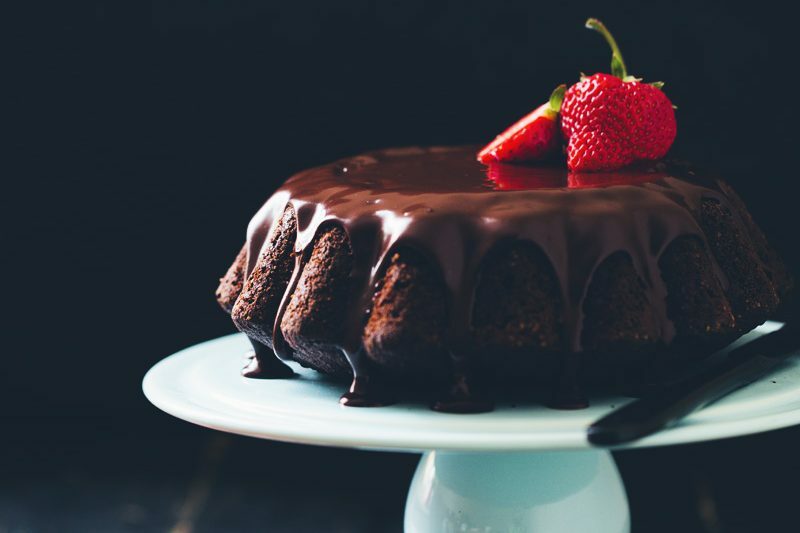 Serve the cake cold but not deep-frozen. Congratulations guys!!! :) That's amazing. So happy for you both. I have to say, the saffron falafels packaged like presents in cabbage is amazing!!! So, so clever. What a great idea. You are both so talented. The pomegranate cake looks fabulous. I made a raspberry one, but I like the new spin for the holidays. Will definitely be giving the falafels a try. Thanks for sharing. Congrats on working with B.A.! The menu you created is festive and so appetizing! Gorgeous! This is amazingly creative. We are vegan, nut free, wheat free, oat free, soy free sesame free, corn free, grape free, and tomato free but even though I can't make all of these for my fod allergic family I am in awe and will be adapting some flavor combination ideas. Gorgeous. Bravo! Congrats on the story in Bon Appétit! You've made it! I'm visiting the US and just saw this in Bon Appétit and regaled my family with this menu last night - even my carnivorous relatives LOVED everything. I missed Thanksgiving so this was a perfect way to have a belated Thanksgiving-y meal using seasonal produce... and all gluten and lactose-free! Thanks for feeding me well on BOTH sides of the Atlantic ! 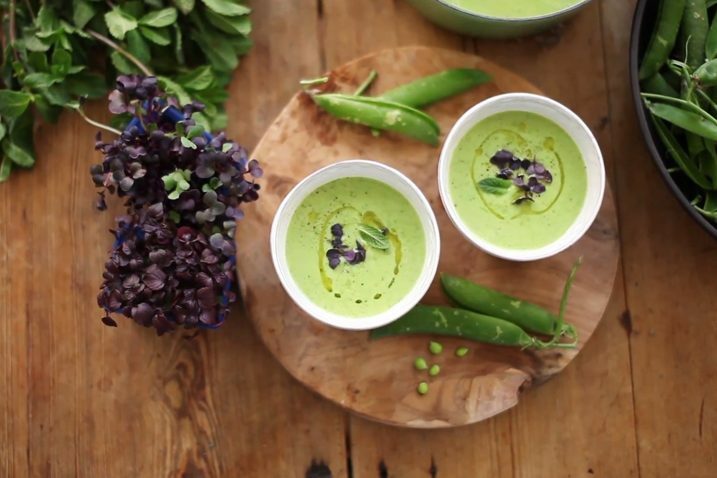 Looking forward to more gluten and lactose free recipes coming from you guys. So much less depressing knowing that gluten and dairy free doesn't mean TASTE-free too! Sincerely, your tart-loving friend in NY, Rebecca PS When does the GK Stories BOOK come out? ;) Anxiously awaiting that! I am making this entire menu (or replacing the frozen cake with the chocolate persimmon tart you posted a while back) for friends on Monday night. AMAZING color, textures and flavors. You guys just rock the party! CONGRATS on your work with B.A.! Weeee!!! This looks like a real feast. I look forward to spending Christmas with family in Sweden this year - it will be the usual julbord, but this looks like a great alternative for when I make it myself. We will definitely try the saffron felafel! And congrats on working with Bon Apetit - that's a real coup! So beautiful! Congratulations. Incredibly well deserved. Really looking forward to making that falafel. What an honor! i think i would be dancing too, congratulation on that. I really love the red cabbage warp with the falafels, the string adds such a nice festivness to the dish. The whole menue is wonderful ! I love this! This is my first gluten-free and (mostly) vegan Christmas, so I'm very excited to have some new recipes like these. I'm a lurker mostly, but I wanted to tell you how much I adore your blog. It's one of my very favorites. Merry Christmas! What an incredible opportunity! I would definitely be doing that happy dance too. The menu looks perfect and is so very pretty. I'm sure this was loads of fun to think of recipes for B.A.! Wow, everything looks so delicious! I love the colors!